Do nine out of 10 new businesses fail, as Rand Paul claims? For the purposes of this fact check, we are interested in Paul’s claim that nine out of 10 businesses fail — which he claimed ensured that nine times out of 10, the wrong people would benefit from government largess intended to boost new businesses. What’s the time frame? Two years, five years, 10 years? That can make a big difference. Does “fail” mean that it goes out of business because it was not financially viable? Or does that also include data about successful enterprises that merge with another company? Wouldn’t failure rates be different for some industries than others? Does it make sense to lump all businesses together? One of the most cited studies on this issue (No. 3 in the chart above) was published in 1989 by Bruce D. Phillips of the National Federation of Independent Business and the late Bruce A. Kirchhoff, director of the technological entrepreneurship program at New Jersey Institute of Technology. 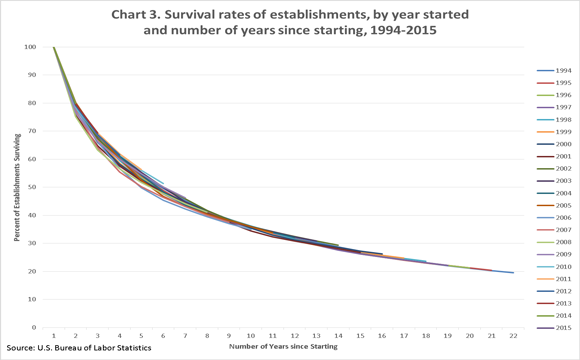 They concluded that new establishments with 500 or fewer employees show an average survival rate of 39.8 percent after six years, but that there were wide variations among types of firms. The source for the SBA statement is the Bureau of Labor Statistics, which offers this chart on survival rates. The pie chart below, also from smallbusinessplanned.com, demonstrates this phenomenon. There is recent research by Harvard University’s Shikhar Ghosh that three out of every four venture-backed firms fail, which was newsworthy because the failure rate was higher than normally cited by the venture capital industry. But here, again, the use of the phrase “failure” is a bit misleading. Only about 30 percent result in a total loss of the venture-capital investment; the rest simply did not exit with a full return of the initial investment, such as through an acquisition or initial public offering. We sought a response from Paul’s aides but were told an immediate answer was not possible. We will update this column if we get more information. Investing in a new business does have a certain level of risk, but it is not nearly as high as Paul claimed. A senator should avoid repeating such economic myths on television, thereby perpetuating false impressions.